Ratatouille is the perfect summer vegetable dish. 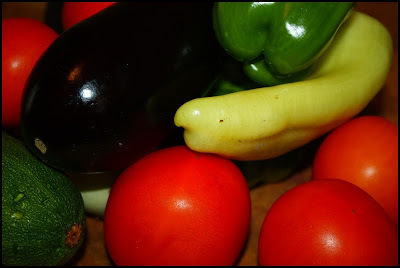 The ingredients are at peak season, and are easily grown in a home victory garden...I in fact grew these. The main ingredients--zucchini, eggplant, tomatoes, peppers, and basil--need very little tending, they almost grow like weeds. With its tongue-twisting title it may come off as a somewhat intimidating recipe, but on the contrary; it’s a simple and versatile country dish that is based on using seasonal vegetables. Its name is said to come from the archaic French word, touiller, meaning to stir or toss. 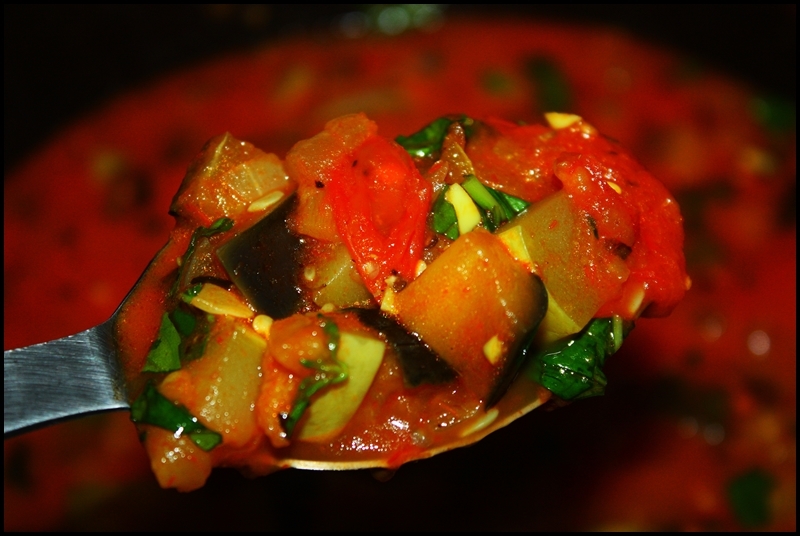 It’s a versatile recipe that can be served hot, at room temperature, or even chilled; it will taste better the second day after its flavors are allowed to “marry.” Ratatouille is excellent as a side dish, an entrée, or tossed with pasta. With the addition of a little wine or broth, it also makes a flavorful braising base for chicken or seafood (I ate it for dinner this evening tossed with penne pasta and plenty of Parmesan). It's really simple to make, very flavorful and healthy, and it keep well also. Heat the olive oil in a large skillet. Add the onion, bell peppers and garlic; sauté for 5 minutes over medium heat. Add the zucchini and eggplant; sauté 5 minutes. Stir in the salt, pepper, tomatoes, and broth. Bring to a simmer and allow to cook for about 30 minutes, stirring as needed. If it becomes too dry add more broth. Stir in the basil a few minutes before serving.